It's that time of year again for LACo Ocean Lifeguards: Rechecks. We found ourselves late this morning in Manhattan Beach and so we grabbed our camera equipment and shot some photos of the beach, the buoy course, etc. et al in Manhattan Beach adjacent to the Training Center at 26th Ave.
And when we hoofed it out to the beach, across the soft sand and approached the tower at 26th Ave., we discovered Veteran Southbay LACo OL, Will Didinger on duty!... and so we bumped fists and exchanged "Hi Will" greetings. The buoy course looks about the same as last year but perhaps a bit further out, at least that was what we heard from an off-duty LACo Lifeguard Captain who had just finished a surf session and was chatting with the aforementioned LACo OL at T-26. The water is wonderful. (According to Capt. Jay Butki, the water temp near Santa Monica is hovering near 70 degrees Fahrenheit). The usual suspects exist in terms of inshore holes, lateral currents, etc. We recommend that you get down there if you have a chance in advance of your recheck and swim the course. Now that I have 45 years of lifeguarding to look back upon, I was particularly impressed with the recheck instructors this year. Not only are they the best of the best that lifeguarding has to offer but they are a FANTASTIC group of young men and women who represent the BEST of our whole society! They are the next generation of men and women who have chosen to do something with their lives to "give back" to society in a meaningful way... some of them don't even know it yet, but I do! They are a very, very special group of kids who will make a difference in a very tangible way to so many lives.... I am proud to be a part of it. "Acting Chief" Moseley gave a fantastic talk. He is a gifted communicator and reached his audience like no Chief before. His topic was urgent and important and his delivery and emphasis made it even more effective. I can see now, after his talk, why we as a lifeguard service need to be more aware and respectful of our situation. The "fire department" lecture on "sexual harassment" was a complete disappointment. The lecturer was unprepared and a very poor communicator. After following Moseley and the other articulate, rehearsed and knowledgeable lecturers this person looked and sounded like an unprofessional, uninformed, inexperienced and ineffective waste of time. The fire department needs to fix this. For a topic that they are willing to spend 3 hours of precious "recheck time" and hand it over to this type of person, is a huge waste of time and just delivers the kind of message to the audience (US!) that this topic is NOT important and we are just "sleep walking" through the process. If the FD wants us to take this topic seriously, they better give us a serious, informed, articulate person to deliver the message. It could not have been a bigger waste of time. p.s. we also understand that our lifeguards need to get their days in and they will no longer be able to get waivers for days not worked or waivers of rechecks, so heads up to all of our LACo Ocean Lifeguards!... "Get your minimum days in and do the recheck!" And just as we were leaving the beach at Ave-26... we see someone else we recognize, namely, OLS Joji Abasolo, who informed us that he just got back from the Philippines where he competed in the Philippine National Surf Lifesaving Championships and brought back some hardware! Well done, Joji! And then we headed back toward home in Central Section.... woo hoo!... and strafed Dockweiler on the way and gave a wave to OL E. Liberty and the rest of the Gundo Wrecking Crew. Eldin Onsgard – And This Ain’t No Fish Tale! Eldin, off duty. Photo courtesy of Jan Onsgard. 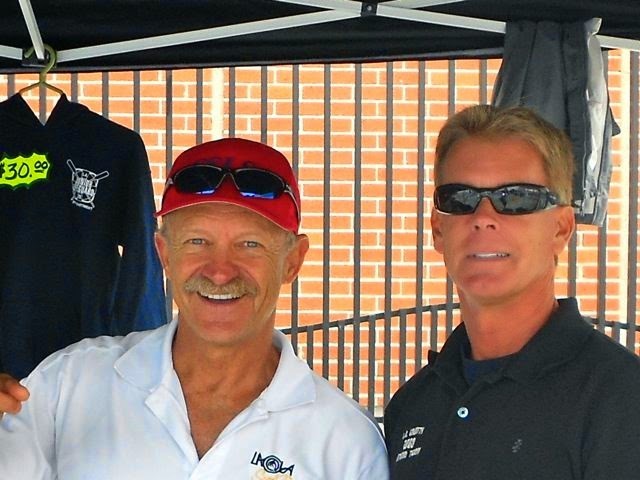 What do actor and former UCLA quarterback Mark Harmon and Ocean Lifeguard and Competitor Eldin Onsgard have in common? They are both members of the Pierce College Athletic Hall of Fame! Eldin will be inducted May 28 into the Hall of Fame Class of 2014 with 13 other Pierce College alumni, a who’s who of collegiate and professional athletes, such as Olympian Kevin Barnett and MLB infielder Rich Auerbach. Previous inductees include MLB stars Doug DeCinces, Barry Zito and Coco Crisp, and two-time Super Bowl champion/Pittsburgh Steelers Safety Jimmy Allen, among others. Harmon was inducted in 2010. The Official Program Blurb about Eldin says: Attended Pierce from ’70-’72. He was an MVP Water Polo --1st Team All-Conference Water Polo/Diving. All-American Diving. Coached [swimming and water polo] at Pierce from ’79-’86. He has been teaching for over 30 years, and is currently at East L.A. College. He’s been an LA County Lifeguard for 45 years. See attached pics for images of the Eldin era. 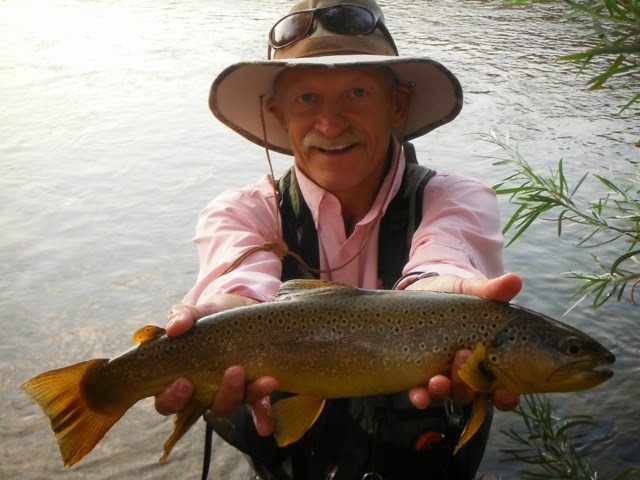 We all know about Eldin’s skill as an angler, visiting the Nation’s rivers and streams to catch the indigenous fish; his considerable competitive acumen and how he annually racks up multiple First Places in the 60-64 age group at CSLSA Regionals and USLA Nationals -- he’s apparently also a performer. But what isn’t mentioned is that during his Pierce College days, Eldin also played volleyball, was a member of the Cheerleading Squad, and was in the Dance Theater and Choir. We can thank Jan Onsgard for this highly illuminating additional information! Now we know why Eldin is so LITHE! With that diverse set of skills, Eldin is the very definition of a Renaissance Man. 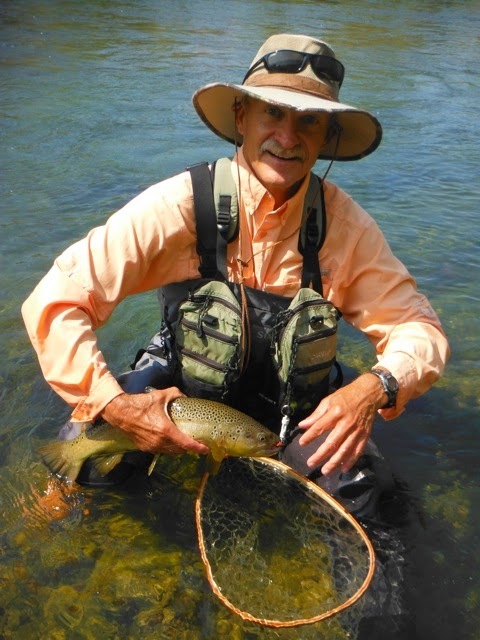 The Trout Master. Photo courtesy of Jan Onsgard. Eldin in the hunt... Photo & © Will Maguire 2013. *** Many Thanks to Adam Sandler for sharing this great accomplishment of Eldin's with all of us! HONG KONG LIFE SAVING SOCIETY: HKLSS Rocks! The editorial staff of "County Recurrent" News recently returned from Hong Kong where the undersigned attended the annual meeting of the International Trademark Assn. (aka, INTA) that is a must go to event each year for avid trademark lawyers, even those that moonlight occasionally as recurrent beach lifeguards... One of the highlights of this trip aside from the aforementioned INTA Annual Meeting was the visit to some of Hong Kong's finest beaches and their lifeguard facilities. In this regard, the Hong Kong Life Saving Society is the heart and soul and the historical force behind the success of life saving in Hong Kong. First and foremost, add HK to your lifeguard bucket list! Trust me! 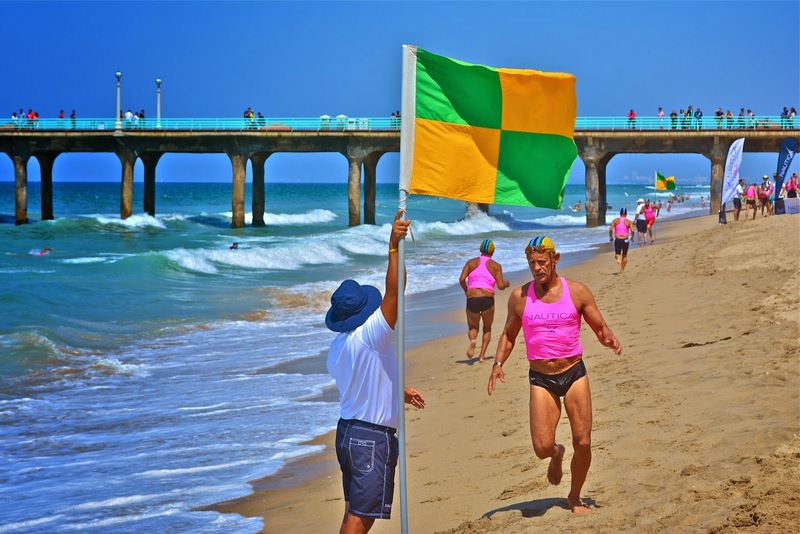 The beaches are beautiful, well maintained and are guarded by fit and trained lifeguards from April - November. Over 40 beaches are supervised by their lifeguards and they are also netted to keep out sharks. Big Wave Bay beach as seen from the Dragon's Back trail. The HK government agency that staffs the guards is the LCSD. For instance, at Repulse Bay there is a working lifeguard station with an LCSD office with video monitoring of the swimming area, as well as a garage full of lifesaving equipment (see photos below). Repulse Bay is just one of over 40 public beaches that have lifeguard safety operations and shark netting in Hong Kong. In partnership with the LCSD is the separate privately held corporation, the Hong Kong Life Saving Society (aka, HKLSS), which has been around now for 60 years. As previously mentioned, HKLSS is the heart and soul of HK Life Saving. HKLSS does the training and certification of the guards. This is done at Tower #4 at Repulse Bay. 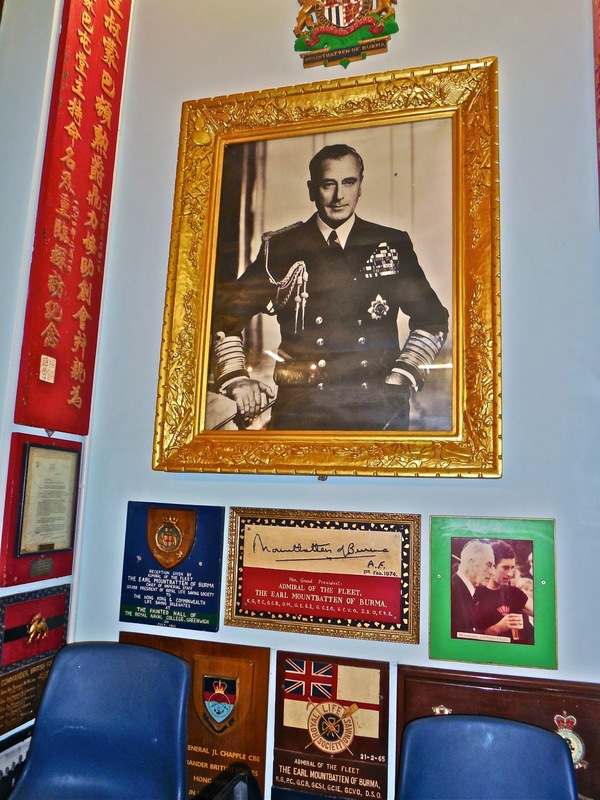 There is additional equipment storage at Repulse Bay adjacent to the HKLSS Mountbatten Hall of Life Saving (more about this Amazing and Awesome Shrine to Life Saving below). Backing up a bit, before my trip, I contacted World Traveler and G Wagon Spokesman/LACo Rescue Boat Captain, Jay Butki, who put me in touch with several HK guards that he had met and got to know in the past at the Sanyo Bussan lifesaving competitions held in Japan over the years. Through email, I was able to learn of some of their favorite beaches: Repulse Bay, Shek-O, and Big Wave Bay. Contemporaneously, I spoke to USLA President, B. Chris Brewster, at the recent USLA 50th Anniversary in Huntington Beach last month and asked if he could write me a Letter of Introduction (LOI) to HKLSS. This LOI was previously recommended to me back in 1986 before I traveled to New Zealand and Australia and I received a very nice LOI from then Assnt. Chief, Howard Lee, that I still have. Side-note: As the club manager of the Noosa Heads SLSC (Alan Coates (R.I.P.) in Queensland in Australia was reading my LOI in March of that year, out from the bunk room walks LACo OL, Bradd Schwichtenberg, my Pali High swim teammate!... In any case, back to present day: Chris Brewster prepared a letter and sent it off to his colleague and friend, Patrick Yeung, the President of HKLSS. I also received an LOI from CSLSA President, Mike Buerlein, as well as Acting Chief Steve Moseley of our very own LACo Fire Dept Lifeguard Division. These letters were sent off to both the Hong Kong Life Saving Society and LCSD via email. Upon my arrival in HK, I also hand delivered copies of my Letters of Introduction to the downtown HK office of the HKLSS in WanChai on Hennessey Road on Saturday, May 10th. The HKLSS office had just closed for the day and I was only able to snap off a couple of photos at that particular time. That was a Saturday, as mentioned above. On Monday, May 12th, I got a call from the Office Manager of HKLSS at my hotel and we set up a time and place for lunch and a visit to Repulse Bay for Friday, May 16th. At the Hong Kong Life Saving Society Office with HKLSS President, Patrick Yeung, Phd. Next we drove on out to Repulse Bay where I got a tour of the working lifeguard station run by the LCSD. It was all business in the office and our visit was brief so as not to interfere with their operations. Next, we walked the grounds and beach and observed the lifeguards towers at Repulse Bay and the shark netting. 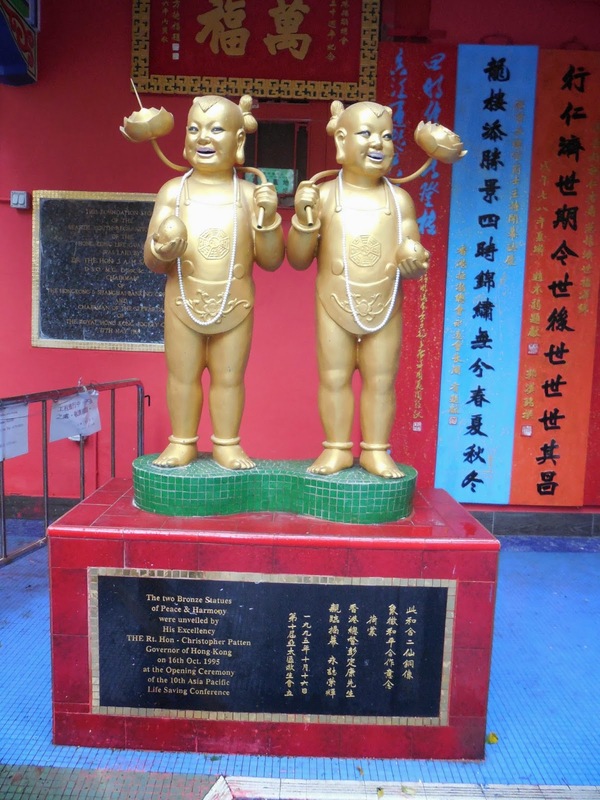 Unanticipated and next was the adjacent very classic Chinese architecture and statues of Gods which was a real treat. These ceremonial and traditional Gods were those with respect to the ocean and life saving. Many photos were taken! :-) I was now being swept up in a euphoria of life saving and was stunned by its breadth. I crossed a short bridge that added 3 days to my life apparently and I walked past a God who protects Life Savers. I got to hold hands with the God of Wealth and I have been assured that wealth is in my future. I can say without any doubt that the wealth of humanity and camaraderie shared this day has made me a very wealthy man. The unknown and unexpected treat was still to be observed. We walked next into a building that was being remodeled and was draped with a very large green colored tarp to protect it from the wind and rains. We walked up some stairs and inside into a hall and it was as if I had been transported to a fictional and magical hall right out of a fairy tale or a set at Disneyland. I was overwhelmed as I took in this gigantic hall. The colors, the statues, the plaques, the awards. I was stunned and in shock and in awe. My hosts asked me what I thought of this place and I gushed that I felt like I had gone to lifeguard heaven! I felt like a little kid in a magic castle. I could not believe what I was seeing. They could have just left me there and I would be content to never leave! note: The Hong Kong Life Guard Club was the previous name of the Hong Kong Life Saving Society. Below, the gracious hosts from the Hong Kong Life Saving Society, L2R, Alex Liu, Peter Yeung, and Apple Chan. As I walked around the room with my jaw open and dropped, I observed many, many plaques identifying lifeguard agencies from all around the world and I was stuck with how inclusive this Temple of Life Saving truly is. That is its most treasured characteristic, in my opinion. This is the Hall of Life Saving for Hong Kong Life Saving Society members only but this Temple honors Lifeguards from ALL AROUND THE WORLD. To have the opportunity to visit and tour these hallowed grounds that is so respectful of our chosen calling to save lives was something I will never forget and will always treasure. I cannot thank my hosts enough for this very special opportunity. To witness and observe the inclusiveness of this hallowed ground has reaffirmed my own commitment to inclusiveness and to continue my personal mission of communicating and keeping my colleagues in the loop as much as possible through "County Recurrent". To know that our colleagues in the HONG KONG LIFE SAVING SOCIETY understand and appreciate our shared passion, commitment and mission of inclusiveness has been a real gift. excerpt: "... 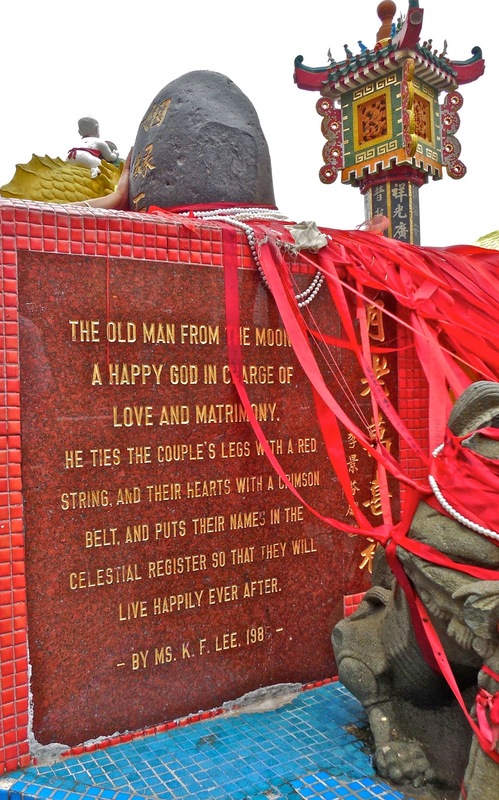 The Tin Hau temple is also, appropriately, home to the Hong Kong Life Guard Club Training Headquarters..."